Geeks Toy is trading software for the betting exchanges, but how good is it? There are a large number of different pieces of software online that are designed for trading on Betfair’s exchange. Frankly, there are so many that a recent investigation into the major examples on the market took me 3 weeks of research. In spite of that time spent, there weren’t really many examples that I felt really warranted a more in depth look, however one that does, is Geeks Toy. Having had a chance to trial Geeks Toy during my recent research, I realised that the software probably deserved its own more extensive review. After all, it is one of the highest rated pieces of trading software on the Betfair app store. This may not necessarily be the best metric however, as almost all software that is rated on the Betfair website is almost universally positive. All of that aside, if you try to examine the market for Betfair trading software, you can almost guarantee that Geeks Toy will crop up somewhere. This is a highly competitive market and any software that can garner a name for itself deserves to be looked at in detail. In spite of the overwhelming acclaim that Geeks Toy has received elsewhere, there is ultimately very little that it does differently to other pieces of Betfair trading software. So with this in mind, is Geeks Toy actually a worthwhile purchase? In order to answer this question there is rather a lot to consider and it is over the course of this review that I intend to do just that. 1 What Exactly is Geeks Toy? 2 What Are the Different Features of Geeks Toy? 4 What Else is on Offer With Geeks Toy? 5 So How Much Does Geeks Toy Cost? 6 So What Are the Pros and Cons of Geeks Toy? What Exactly is Geeks Toy? Geeks Toy is a piece of specialist software that allows you to place bets on Betfair’s (and others) betting exchange rather than using Betfair’s proprietary interface that comes with the website. This offers a number of unique advantages when compared with “vanilla” Betfair (that is to say the standard Betfair exchange), all of which I will explore over the course of this review. There are several main reasons that somebody would want to use Geeks Toy rather than the vanilla exchange. The most prominent of these is that software is generally much faster and more efficient than Betfair. On average, Betfair refreshes its markets around every minute automatically. Software such as Geeks Toy allows you to set the refresh rate which means that you are constantly receiving the most up to date information. Another one of the main advantages of using Geeks Toy over Betfair’s own exchange is in how data is presented. The user interface of vanilla Betfair uses a grid based layout. For those who aren’t familiar with this, I suggest that you head to the Betfair website. This grid based layout is also the most popular in terms of how most software present the data by default. With Geeks Toy however, there are a number of different additional options available, all of which hypothetically allow you to be more successful. The final thing that is worth mentioning about Geeks Toy is that it is one of the few pieces of software that isn’t just tied down to Betfair. In fact, Geeks Toy can be used on Betdaq (which is arguably the second largest betting exchange on the market) as well as Matchbook. Furthermore, the software for trading on these alternative betting exchanges is entirely free. What Are the Different Features of Geeks Toy? Geeks Toy has a number of features and unique selling points listed for it. Some of these are much more useful than others, however I do feel that all of them deserve something of a mention and a brief look at what they bring to the table. All of these key features are the ones that are listed on the Geeks Toy website, however I aim to cut put the sales pitch into some proper context. The one feature that the Geeks Toy team appear to be most keen on using to get people on board is the supposed “lightning fast” and “responsive interface”. Realistically, this means features that I have come to expect from almost any piece of Betfair trading software. This includes things like one click betting and significantly faster monitoring of price changes. The next two features in my eyes are one and the same and these are multi market trading and enhanced market navigation. The multi market trading is mostly about being able to bet on any market (as you would well expect from a piece of trading software), however it also talks about how you can arrange the markets. The enhanced market navigations most useful feature is the ability to set up customised cards that only show markets relevant to your betting. The trading ladder on Geekstoy is similar to that which you will find on most such applications. Easy to navigate and the usual settings can also be applied, reversing the ladders, matched liquidity colouring, and more. Geeks Toy comes with a number of different ways that you can configure both the charts and the in play interface. By allowing users to display information and odds in different ways, it can provide an edge during trading. The charting allows you to identify market trends earlier, something that is very valuable to traders whilst the different in play interfaces allow you to quickly monitor and take advantage of odds changes. This customisation doesn’t simply end at the display of graphs and charts. You can actually customise the way that Geeks Toy looks in a variety of different ways. These range from the very superficial to quite in depth changes to the user interface. Geeks Toy also comes equipped with built in functionality to allow for easy dutching and bookmaking. These help you to calculate figures etc. quickly and easily, something that both of these methods of betting require. Whilst there are plenty of tools available online that do this for free, the fact that Geeks Toy allows you to do it within the software really helps to streamline the process..
For me however, one of the main selling points that is overlooked with Geeks Toy is the ability to trade on different betting exchanges. Whilst I don’t really see why anybody would go outside of Betfair (given the fact that it is the biggest and most liquid betting exchange), I have to credit Geeks Toy as being one of the few examples of software that is set up this way. What Else is on Offer With Geeks Toy? Aside from the software, one of the main focuses of Geeks Toy is the claimed after sales experience (this is also discussed by their users online). There is a lot here to discuss and it really isn’t a bad thing. If anything, it is arguably one of the strongest points of Geeks Toy as a whole. The first thing that is on offer is a comprehensive user manual. This shows you how to take full advantage of all of the features that Geeks Toy comes with. Personally, I find that you shouldn’t really need this to much as the software isn’t really that difficult to follow along. The only time you may need to refer to the user manual for Geeks Toy is when you are using some of the more complicated features. There is some video training provided for Geeks Toy customers however the vast majority of this simply ties in to using the software. Whilst this isn’t an inherently bad thing, some other Betfair trading software that I have looked at before now comes with betting guides and in some cases, full video training courses on different betting methods. As mentioned, the crown jewel for Geeks Toy however has to be the user forum. This is massively comprehensive and covers a number of different subjects. These range from support and help with using the software to announcements and updates. The majority of this side of things comes from the team behind Geeks Toy and in many ways, it simply functions as a support desk. Where the Geeks Toy forum really stands out is when you start to look at the volume of bettors, all of whom share a common goal. There is advice on a huge array of topics. These include things like betting strategies (all broken down based on the sport and Betfair market), betting technology and even a special area for newbies. Geeks Toy also has sub forums for a number of topics unrelated to betting. So How Much Does Geeks Toy Cost? When you first decide to sign up for Geeks Toy, the service comes with a full 14 day free trial. This is no obligation and doesn’t require you to provide any payment details for a full subscription at a later date. The 14 days is one of the more generous free trials that are on offer when compared other examples of Betfair trading software. Once your free trial has lapsed, you will find that options for Geeks Toy are unfortunately rather restrictive, as you would expect. The software also comes with a discount for a yearly purchase. You can purchase either a 3 month license to the software for £20 or alternatively, you can pay for a whole year for £60. Whilst the annual option is pricier, it does equate to essentially a free 3 months of usage. This is all at the time of writing, and subject to change. As is standard for software of this nature, Geeks Toy doesn’t offer any money back guarantee. So What Are the Pros and Cons of Geeks Toy? Trying to weigh up the pros and cons of a piece of Betfair trading software can be a very difficult thing to do. This is mostly because there isn’t a lot of difference from one example to the next. Almost all of the software that I have trialled (which is a pretty substantial amount) has a large number of similarities and the differences are generally rather small. This means that in order to judge Geeks Toy against other pieces of software, you have to look at some of the finer details. The first thing that has to be said when looking at Geeks Toy is that it is a very well balanced piece of software. There is very little that I have to say about it that is necessarily bad. One main advantage I would say that Geeks Toy has over some of it’s rivals, is that the Market Overview screen is actually quite detailed and is easy to view. For example on Bet Angel, the market overview feature seems to be somewhat of an after-thought, and the zoom features when trying to actually set up the viewing is quite tricky, and limited. Geeks Toy does not have that issue. There are two things that you must compare a piece of software to in my optionion. The first of these is Betfair’s own exchange. Making this comparison however is almost redundant as I can’t think of very many pieces of software which aren’t better than the vanilla Betfair exchange. With that having been said, there is the comparison to other pieces of software and this is where Geeks Toy finds itself in tougher ground. First of all, I want to look at what Geeks Toy gets right. As I have touched upon, it does everything that you would expect. 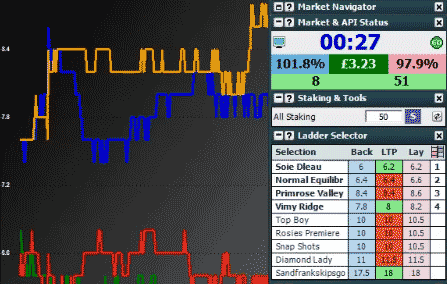 Features like a ladder interface and customisable graphs and charts are par for the course with any piece of Betfair software. It is also quick enough piece of software with refresh rates that are more than acceptable. The real big positive for me when it comes to Geeks Toy rather doesn’t actually come from the software itself. Instead, the biggest strength that Geeks Toy has lies in the community. For many products, a forum is a tacked on after thought that the product creator uses to communicate updates and the like. Geeks Toy however has a thriving and active community with this comes a wealth of experience, knowledge and betting insight. In terms of the cons, the biggest one for me lies in the fact that Geeks Toy doesn’t really have a specialty over and above what is already out there. There are a lot of different examples of software on the market that fall into this “Jack of all Trades” category. Not neccessarily a bad thing, because at the end of the day we are talking about trading software, and they all pretty much do a similar job. Some look different, and some have dedicated features. For example on Bet Angel you have the in Play Trader which is very useful if you cannot watch streams for example. Regarding Geeks Toy, there are examples that are much less expensive and much more flexible in terms of pricing, whilst there are also examples of software that are much more complete (albeit at a higher price). So this comes down to price, and what you actually need the software to do. It is important to acknowledge that Geeks Toy is a very popular and a pretty decent piece of kit. As I have mentioned numerous times, it doesn’t really do anything wrong. It is also reasonably affordable. 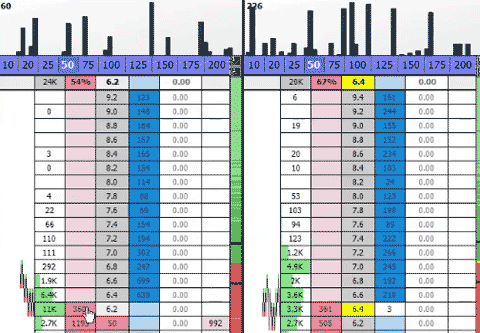 One of the biggest problems that I noticed across the board with all Betfair trading software is the lack of variety. There is a vast expanse of middle ground where everything is more or less the same. This is an area that it is very easy for any software to lose its identity in. Whilst some choose to go really far out with their approach to what a software can do, most choose to try and create a specialised niche. A feature that perhaps other software doesn’t have. There is nothing really about Geeks Toy that stands out from the crowd regarding specific tools, but what it does, it does very well indeed. Cymatic Trader also falls into this category for me, not really doing anything to stand out, however it is very reasonably priced. This is reflected in how the software looks however. Bet Angel on the other hand goes the other way and is quite expensive (£150 a year! ), however it does have a few features that you don’t see elsewhere. It is also really easy on the eye and frankly, a joy to use. Then you have Gruss Betting Assistant which is what I would call the more basic of all the software applications. Although it looks great, it does not have the detail of say a Geeks Toy, or a Bet Angel. Most of these software applications come with a trial, so it may be best to trial all of them and see what suits you best. For me, I suppose that the biggest compliment that I can pay to Geeks Toy is that it is a safe option. You won’t go far wrong with it and it will appeal to a wide variety of traders. Geeks Toy is extremely popular with many traders, and well worth a look at.